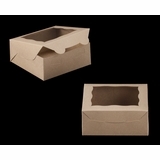 Buy Natural Brown Cupcake Boxes and Get More From Less! Take a close look at your Natural Brown cupcake boxes and you can actually see the virgin fibers. This is because these cupcake boxes are not coated or bleached with harsh chemicals. Because this paperboard is left in a more natural state, it retains the strength of the trees from which it was made and is the strongest material we carry (even though this material uses 25-30% fewer trees to produce). You should also know that even the crystal clear window material is certified biodegradable. Both the Natural Brown paperboard and window film are made from SFI (Sustainable Forestry Initiative) lumber - lumber collected and reforested utilizing environmentally friendly practices. Give your cupcake presentation warmth, strength, and even peace of mind. 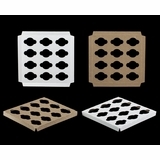 2 1/2 x 2 1/2 x 2 1/2 Inch Cupcake Box with Window - Matching Cupcake Holders Listed Below. 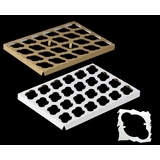 True Story: We wanted to make a miniature cupcake box that is the perfect size for the slighter build of mini cupcakes. Since we design and manufacture your cupcake boxes in our Box Shop, we did what we wanted and BEHOLD! We give you this miniature cupcake box with our signature circular window. Minis look amazing in this Natural Brown box. 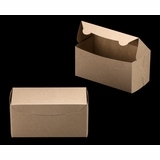 2 1/2 x 2 1/2 x 2 1/2 Inch Cupcake Box without Window - Matching Cupcake Holders Listed Below. This handsome little cube is the perfect little domicile for a mini cupcake looking to surprise a hungry cupcake fan once they open the windowless lid. 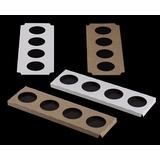 Match the Natural Brown paperboard with the brown-side-up reversible mini cupcake insert for a presentation that looks like a mod little apartment for any single miniature cupcake. 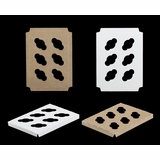 4 x 4 x 4 Inch Cupcake Box with Window - Matching Cupcake Holders Listed Below. Show off your cupcake 'in the natural'. 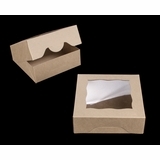 Natural Brown cupcake boxes are made with 18% pre-consumer recycled material. 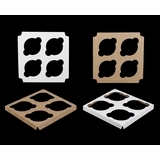 This means fewer trees were used to make the material for the warm looking boxes that give your cupcakes a more organic presentation than conventional bakery boxes. See those cupcake holders down there? They can be used kraft-side-up to match your Natural Brown single cupcake boxes perfectly. 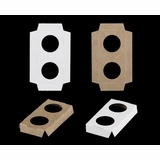 We know they match perfectly because we make your cupcake boxes and holders, right here in BRP Box Shop. 4 x 4 x 4 Inch Cupcake Box without Window - Matching Cupcake Holders Listed Below. 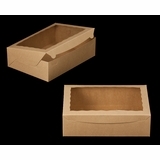 Place your cupcake treasure in this sturdy little single Natural Brown cupcake box. This one is almost exactly like the cupcake box above it, but minus the window. Because this cute little treasure chest for a single one of your cupcakes doesn't have to go through our window machine, it is a bit less expensive than its windowed sibling. This comfy little single cupcake box will work with any of the cupcake holders you see listed below. Just turn the single cupcake holder brown-side-up to make a match. 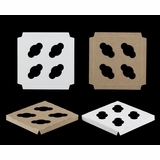 4 x 4 x 4 Inch Cupcake Simplex Box Set with Window - Matching Cupcake Holders Below. 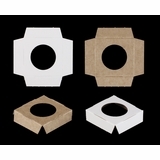 4 x 4 x 4 Inch Cupcake Simplex Box Set without Window - Matching Cupcake Holders Below. 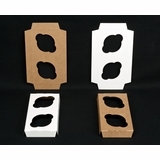 5 x 2 1/2 x 2 1/2 Inch Cupcake Box with Window - Matching Cupcake Holders Listed Below. 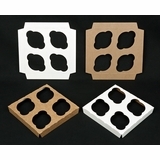 8 x 4 x 4 Inch Cupcake Box with Window - Matching Cupcake Holders Listed Below. 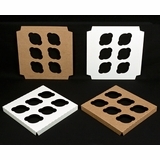 8 x 4 x 4 Inch Cupcake Box without Window - Matching Cupcake Holders Listed Below. 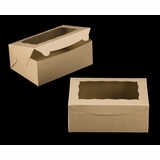 Pick up some two count cupcake holder inserts you see listed below, and slide them into this windowless Natural Brown cupcake box to have a cupcake packaging system that not only provides support and protection for two of your wonderful works of sweet sculpture, but also serves as a bakery box choice that you and your cupcake customers can feel good about. 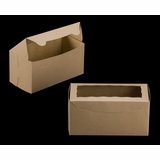 These boxes use 18% pre-consumer recycled material and still stand as the strongest boxes we sell. 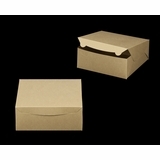 Make these boxes home to a couple of your cupcakes. 6 x 6 x 2 1/2 Inch Cupcake Box with Window - Matching Cupcake Holder Listed Below. 6 x 6 x 2 1/2 Inch Simplex Cupcake Box with Window - Matching Cupcake Holder Listed Below. 6 x 6 x 2 1/2 Inch Cupcake Box without Window - Matching Cupcake Holder Listed Below. 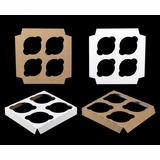 7 x 7 x 2 1/2 Inch Cupcake Box with Window - Matching Cupcake Holders Listed Below. 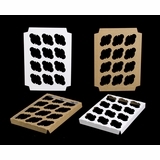 7 x 7 x 2 1/2 Inch Cupcake Timesaver Box with Window - Matching Cupcake Holders Listed Below. 7 x 7 x 4 Inch Cupcake Box with Window - Matching Cupcake Holders Listed Below. 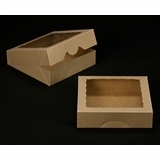 Four of your cupcakes will find a fit home inside this four count Natural Brown cupcake box. 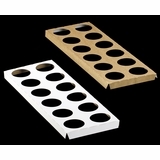 The cupcake holders you see listed below were designed to slide inside this box to prevent a quartet of your cupcakes from sliding into one another. 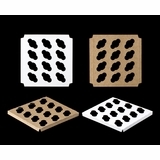 Take one of those cupcake holders and make it showing brown-side-up to have a matching set. Seeing four of your cupcakes framed through the biodegradable window material provides a warm invitation to sample your snacks. 7 x 7 x 4 Inch Cupcake Box without Window - Matching Cupcake Holders Listed Below. If you are looking for a no-frills cupcake box to protect and present four of your hand crafted confections, look no further. The answer is right here! Choose one of the cupcake holders you see below to work perfectly inside this box and you'll have a cupcake solution that not only presents your cupcakes in all of the natural warmth of this unbleached box material, but your cupcakes will be prevented from smashing into one another by having their own little space inside the reversible cupcake holder. 8 x 8 x 4 Inch Cupcake Box with Window - Matching Cupcake Holders Listed Below. 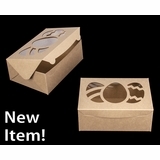 This Natural Brown cupcake box was developed to become a home to a special breed of cupcake - the JUMBO cupcake! Four jumbo cupcakes fit perfectly within this sturdy bakery box when you team it with the jumbo cupcake holder you see listed below. Jumbo cupcakes are big! Four of your big jumbo cupcakes will look great evenly spaced and seen through the crystal clear window made of our biodegradable window material. Your massive sweets are safe within the rigid walls of the strongest box material we carry. 8 x 8 x 4 Inch Cupcake Box without Window - Matching Cupcake Holders Listed Below. If you're into jumbo cupcakes, your sweets aren't messing around...and neither is this box we've built to secure four of them in Natural Brown style! Not only is our Natural Brown cupcake box material the strongest kind of paperboard we use to build boxes, it is made from trees harvested under the Sustainable Forestry Initiative. 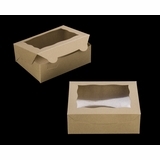 These boxes actually look natural because no caustic chemicals were used to bleach the natural fibers. Strong. Environmentally friendly. Good looking. Affordable. 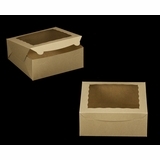 Four of your jumbo cupcakes find a great home inside this Natural Brown cupcake box. 13 x 4 x 4 Inch Cupcake Box with Window - Matching Cupcake Holders Listed Below. 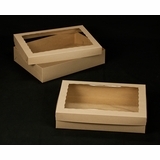 13 x 4 x 4 Inch Cupcake Box without Window - Matching Cupcake Holders Listed Below. 7 x 5 1/2 x 2 1/2 Inch Cupcake Box with Window - Matching Cupcake Holder Listed Below. 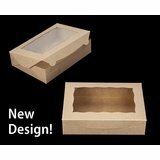 7 x 5 1/2 x 2 1/2 Inch Cupcake Box without Window - Matching Cupcake Holder Listed Below. 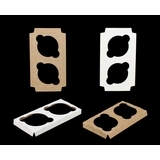 10 x 7 x 2 1/2 Inch Cupcake Box with Stockings Window - Matching Cupcake Holders Listed Below. 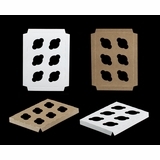 10 x 7 x 2 1/2 Inch Cupcake Box with Window - Matching Cupcake Holders Listed Below. This Natural little beauty is made for minis. 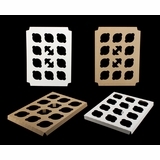 Take a look at the reversible cupcake holder inserts below. 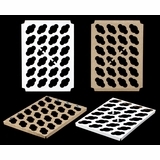 These inserts keep your mini morsels steady and suitable for viewing through the biodegradable window material that we use in every windowed box we sell through the Box Shop. 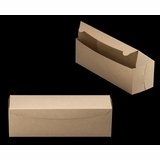 The natural fibers of this box are unbleached and as a result, look great but also supply a strength that is unsurpassed by any of our other box material. 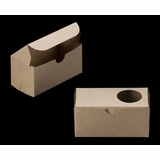 The slighter stature of your mini cupcakes may not require a robust box, but the Natural Brown cupcake boxes also provide a presentation that is warm and comfortable - the perfect lodging for your delicious miniature sculpted sweets. 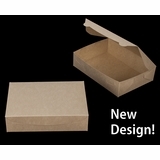 10 x 7 x 2 1/2 Inch Cupcake Box without Window - Matching Cupcake Holders Listed Below. 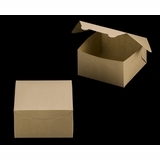 Like the natural wonder above, this cupcake box is made of the strongest paperboard we use. 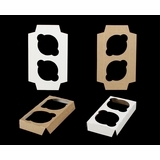 On top of being made of tough stuff, this bakery box is produced with 18% pre-consumer wood fiber. This wood comes from sawmills that have no use for the leftover chips. 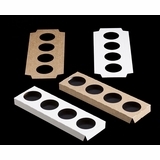 This windowless miniature cupcake box works perfectly with the cupcake inserts you see listed below�because we designed them that way. Use the cupcake holders brown-side-up for an aesthetic match that will add to the delight when hungry hands open this little chest of mini cupcake treasure. 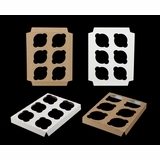 10 x 7 x 4 Inch Cupcake Box with Window - Matching Cupcake Holders Listed Below. 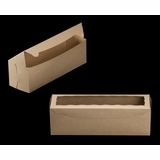 10 x 7 x 4 Inch Cupcake Box without Window - Matching Cupcake Holders Listed Below. 10 x 7 x 4 Inch Cupcake Box with Easter Egg Window - Matching Cupcake Holders Listed Below. 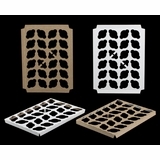 10 x 10 x 2 1/2 Inch Cupcake Box with Fall Seasonal Window - Cupcake Holders Listed Below. 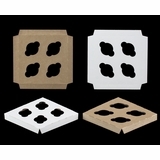 10 x 10 x 2 1/2 Inch Cupcake Box with Window - Matching Cupcake Holders Listed Below. 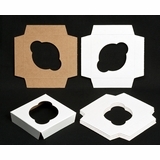 10 x 10 x 2 1/2 Inch Cupcake Box without Window - Matching Cupcake Holders Listed Below. 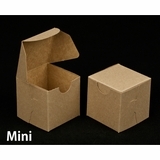 A lot of our Natural Brown cupcake boxes are in our catalog with your minis in mind! If you pair this timesaver box with one of the miniature cupcake holders you see listed below, you will have a cupcake packaging system that will keep 12 of your precious petite sculptures looking inviting and wonderful. The biodegradable plant-based window material is crystal clear and allows one dozen of your cupcakes to use their allure. 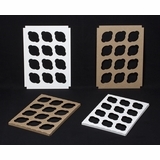 The mini cupcake holders keep your sweet treats evenly spaced beneath the wavy window. This keeps them from smooshing into one another and they just look posh when presented with such poise. Save time and gain some peace of mind when you secure twelve of your cupcakes inside of this Natural Brown timesaver mini cupcakes box. Just pop open the sides of the bakery box and the adjacent sides pop out right along with them. 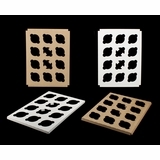 Slip in your mini cupcake holder and you have erected a stage for your cupcakes in no time! 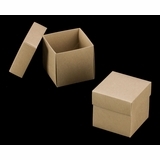 Box Shop customers like these time saver boxes because, well�they save time. 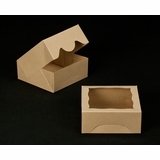 They also look great because the Natural Brown paperboard material reveals its natural naked fibers. No harsh chemicals have been used to bleach the board. Not only does this leave your mini cupcake box looking wonderfully natural, it also means it is stronger! 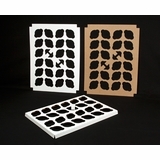 10 x 10 x 4 Inch Cupcake Box with Window - Matching Cupcake Holders Listed Below. This cupcake box can pull double-duty. Your Box Shop has designed this box to work with both standard cupcake holders and the mini cupcake holders you see listed below. Is this interchangeability a coincidence...or the product of chance?! No! 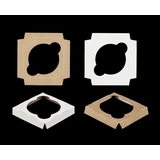 We designed your cupcake boxes this way to give you flexibility when selecting your cupcake packaging. Place your cupcake holder inside of this Natural Brown bakery box with the brown-side-up, and you�ll have a great system for protecting and presenting your cupcakes. 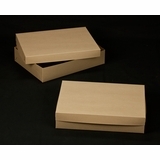 These boxes are manufactured using 25% to 30% fewer trees than other virgin board boxes. 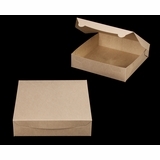 Have a box that makes your cupcakes look great and offers you a little piece of mind. 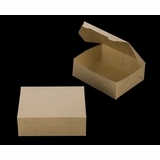 10 x 10 x 4 Inch Cupcake Box without Window - Matching Cupcake Holders Listed Below. Six standard cupcakes or twelve of your mini cupcakes will fit beautifully inside this Natural Cupcake box when you pair it with one of the cupcake holders you see listed below. 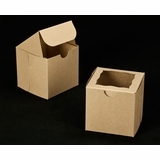 The unbleached paperboard we use to build these boxes is the strongest box material we have. It is strong because it has been spared the harsh chemicals used to turn naturally brown board, white. Turn your cupcake holder brown-side-up and you will have provided your sweets a presentation that is natural and warm throughout. 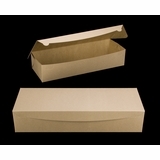 This cupcake box ships flat but folds up in a way that our customers say looks polished and professional. 12 x 9 x 4 Inch Cupcake Box with Window - Matching Cupcake Holders Listed Below. If you are looking for a home to secure six jumbo cupcakes while at the same time looking sharp, you have come to the right box. 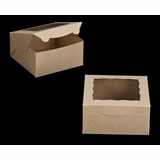 Our six count Natural Brown jumbo cupcake box has been designed to work with the jumbo cupcake insert you see just below. 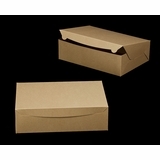 These boxes are �Natural�, not just because they convey a warm feeling when you see the organic fibers in the box material, but also because this packaging is made up of 18% pre-consumer recycled wood. Want to know why your jumbo cupcake box is so strong? It�s strong because a good portion of it is made from the wood chips that sawmills can�t use and don�t want. The window for viewing your six jumbo cupcakes is biodegradable too. 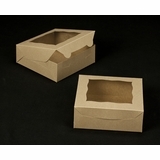 12 x 9 x 4 Inch Cupcake Box without Window - Matching Cupcake Holders Listed Below. 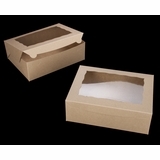 Behold - One of our larger Natural Brown cupcake boxes! It�s bigger because your jumbo cupcakes are bigger, and jumbo cupcakes is what this box was made for. 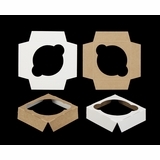 This is our strongest jumbo cupcake box material and when you pair this structure with the six count jumbo cupcake holder you see listed below, you have something special for your sweets. The jumbo cupcake insert prevents your hefty frosted works of art from tumbling into one another. Each jumbo cupcake has its own jumbo cupcake space. 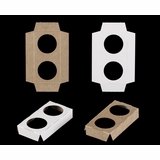 Place the insert into the box, brown-side-up, and the kraft side of the cupcake holder matched with the brown box, creates a natural feel for your entire jumbo cupcake package. 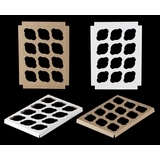 14 x 10 x 2 1/2 Inch Cupcake Box with Window - Matching Cupcake Holders Listed Below. 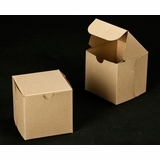 Customers of our customers comment on the Natural Brown boxes we get to build for you. 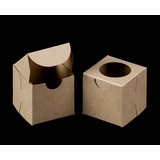 We love the way these boxes look too, especially when partnered with one of the mini cupcake holders you see below. But there are other reasons we think this box is great. Let�s go through the list! Natural brown cupcake boxes are strong. The window is crystal clear for viewing your mini cupcakes and is actually made from plant-based biodegradable material. 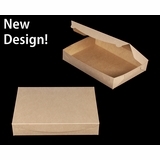 The box material is made with 18% pre-consumer recycled lumber. 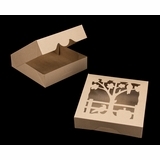 This cupcake box is made with 25% to 30% fewer trees than other virgin paperboard boxes. The lumber that is used to make the boxes comes from Sustainable Forestry Initiative farms. Strength? Check. Beauty? Oh yeah. Green for all its natural brownness? You bet! 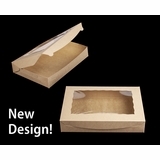 14 x 10 x 2 1/2 Inch Cupcake Box without Window - Matching Cupcake Holders Listed Below. Made for minis with an eco-friendly twist. You know this box is a home that�s been created to provide stylish sanctuary for your mini cupcakes because the two dozen mini cupcake and skinny mini cupcake holders fit it to perfection. 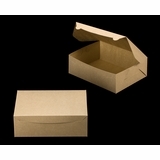 What you may not know, is that the box material you see here is 100% biodegradable. 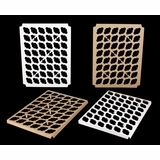 It�s biodegradable because the material is made from unbleached wood pulp. Because the pulp isn�t bleached, harsh chemicals are left out of the process. 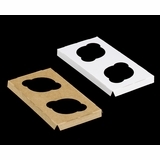 This allows the wood fibers to retain their strength making this box material the strongest we carry. The trees providing the wood come from tree farms that are run in accordance to Sustainable Forestry Initiative standards. A spread of two dozen mini cupcakes look warm and enticing in this cupcake box. 14 x 10 x 4 Inch Cupcake Box with Window - Matching Cupcake Holders Listed Below. Great art deserves a great frame that works to not only preserve your masterpieces, but also to enhance the presentation of your unique creations. Center your cupcakes with a cupcake holder beneath the crystal clear wavy window and you will have a fitting frame for displaying your succulent sweets. That window material is biodegradable, by the way (that�s right � not plastic). The box is too. 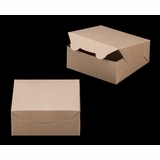 One of the perks of these Natural Brown cupcake boxes is that the fibers that grant the structure its strength are readily visible when you look at your cupcake box. 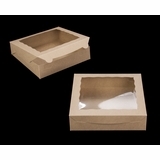 The popularity of our Natural Brown cupcake boxes is growing. 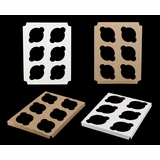 Grab some cupcake holders to secure your cakes and some natural brown boxes and provide the setting to allow your cupcakes to sparkle. 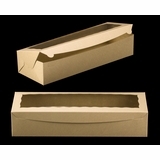 14 x 10 x 4 Inch Cupcake Box without Window - Matching Cupcake Holders Listed Below. You are probably browsing this page because you are a cupcake confectionist and you either a.) 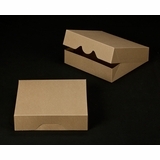 want an eco-friendly bakery box solution b.) 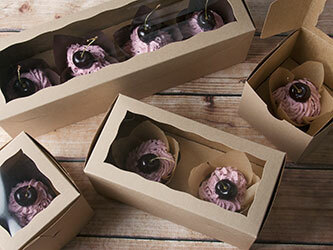 love the organic look of our Natural Brown cupcake boxes or c.) all of the above. No matter how you answer, you will have aced your little Box Shop Cupcake Box Pop Quiz! Strength, professional appearance, and affordability are not mutually exclusive attributes when it comes to getting the right box to show off your cupcake creations. The windowless box you see here is even more affordable than its windowed brethren because it gets to skip the window machine. 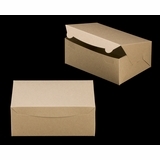 Cupcakes look great surrounded by the warm appearance of this box material, especially when used with a cupcake holder that you erect, brown-side-up. Check those out in the list below. 19 x 14 x 4 Inch Cupcake Box set with Window - Matching Cupcake Holders Listed Below. 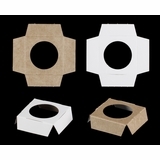 When you get into searching for a serious package that is up to the task of showcasing a substantial sum of cupcakes, then Baker, you are talking about a Natural Brown Cupcake Box Set! Not �The Wiggles Sing Hit Songs from the 50s� kind of box set. 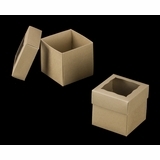 We�re talking a box set that is comprised of both a base and a lid. The Natural Brown base and lid you see here, ships to you in two cases. 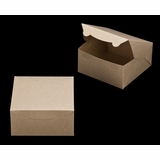 Both set up fast and because the cupcake box material is Natural Brown, it is the strongest paperboard we carry. 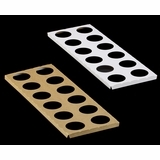 Take a look at the cupcake holders listed below. 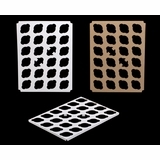 Use these brown-side-up and your cupcake customers will be able to see your substantial sum of cupcakes through the crystal-clear biodegradable window material (not plastic). The cupcake holders keep that frosting pristine by preventing your cupcakes from crashing into one another. 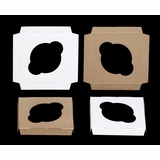 19 x 14 x 4 Inch Cupcake Box set without Window - Matching Cupcake Holders Listed Below. Utilitarian does not have to = ugly. This is a big box, people. A big box built for hauling a big batch of baked cakes. 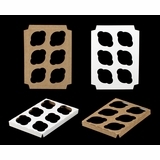 Take a look at the cupcake holders listed below and you�ll see that this footlocker for frosting is engineered to transport and display a couple dozen of your standard cupcake sweets or an even dozen of your jumbo cupcakes. This box is actually a set. The lid doesn�t have a window and is therefore less expensive than the windowed version just above it (this one gets to skip an entire step inside the box shop so we get to sell it for less). This is a no-nonsense box for a no-nonsense parcel of professionally packaged frosted yumminess! Coupled with one of those holders, cupcakes in this box just look good. 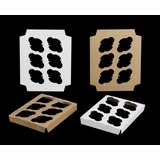 20 x 7 x 4 Inch Cupcake Box set with Window - Matching Cupcake Holders Listed Below. 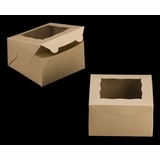 20 x 7 x 4 Inch Cupcake Box set without Window - Matching Cupcake Holders Listed Below.